As before there’s no way to utilize a fill-in-the-blank format for this entry. Please use a separate piece of paper and simply match the numbers. The choices I have provided for the blanks make things a lot more specific than your typical mad-lib. It’ll come out much funnier this way, trust me. Try to fill out your form without scrolling all the way down or highlight just the word prompts on the top half and print it out. Sorry for the inconvenience. Just like the first one I posted, this one works the same way. Words with a ( ) are optional to help flesh out and make sense of the players chosen words. My favorite food to eat after getting wasted is _____1_____ mixed with _____2_____. Once during a blackout I got online and bought _____3_____ _____4_____ for _____5_____ dollars. At one time I went so long without washing my _____6_____ that they ended up smelling like _____7_____ _____8_____. One of the shameful things I’ve done is _____9_____ _____10_____ and then (ended up) blaming ____11_____ for it. Unbeknownst to me, my friends once filmed me _____12_____ all the words to _____13_____ while I was trying to talk to (my, the, a) _____14_____. The first time I tried to sober up I desperately tried _____15_____ ground up (liquefied) _____16_____ because I couldn’t find (or “wouldn’t”) _____17_____. I once found a picture on my phone of me _____18_____ and _____19_____ (on) a statue of _____20_____. Someone once told me that at twelve-step meetings they worship _____21_____ and drink _____22_____ out of _____23_____. I once woke up in (an) _____24_____ wearing nothing but a (an) _____25_____ and looking like _____26_____. I remember stealing _____27_____ and trying to them to _____28_____. Please put your responses into the comments below so all of us can share in your laughter! Comment and share as you wish. When I turned nineteen in 1983 I moved into my first apartment. It instantly became clear that this was not going to be the freedom filled adventure of youthful fantasy. My take-home income was around four hundred dollars a month and my bills added up to about three hundred and twenty of that. I didn’t own transportation so there was no financial burden in this category. I didn’t even have a phone. I did however have a quiet, clean place to call home only two blocks from both work and the nearest grocery store. I had my art, my books, and a (color) television to help pass the time. Food turned out to be a luxury. When it came to eating my belly was filled from the generic aisle. 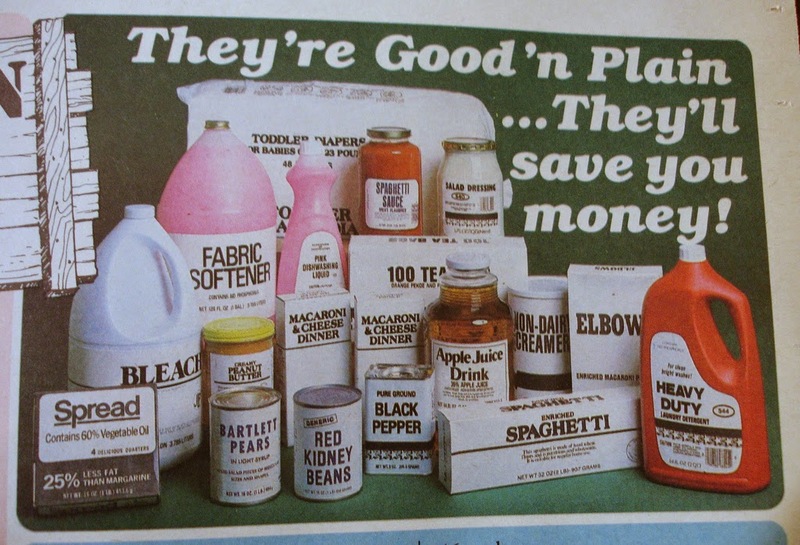 In the eighties there was a “fad” in nationwide supermarkets of extreme no-frills, basic products. They were generally at least half the cost of the lowest comparable item and the quality barely matched the price. Here was my salvation from starvation. Most of my consumption was in the form of macaroni and cheese dinners at 10 for a dollar, ten pound bags of potatoes, and butter and sour cream. My high carb, high fat diet provided enough energy to keep me from looking for a third source of income. Because I worked nights, and held down two jobs, my social life consisted primarily of talking to whomever I happened to be in the vicinity of. I’d never been a party going person nor did I pursue any other kind of pastime that would have drained my wallet. I’d been in a couple relationships already but wasn’t jumping at a chance to renew the experience; besides I couldn’t have afforded a girlfriend even if I wanted one. As it turned out, I didn’t need money at all. On one of my rare days off I came home from the store to find a woman moving into my apartment complex. I was surprised to learn she was on her own, apparently a couple of friends had let her down. So, me being me, I jumped in and began helping. Turned out she has secured the unit directly below mine. Within a couple of hours we had all her possessions through the door. Once it was set up her place was almost as sparse as mine. I found out she was manager of a General Nutrition Center in a local mall and was in the middle of some life changes. There was a ten-year age difference between us but that didn’t stop us from becoming fast friends. I discovered rather quickly she was in (recent) recovery from alcoholism, but that meant little to me. She seemed normal enough and as time strode on our friendship branched into prolonged visits and activities which she paid for and I gladly accepted. Going to the movies or a restaurant was a rare event in those days and I jumped at the chance to do anything other than sleep and work. Eventually, and probably inevitably, our friendship turned more intimate. I remember during one of our conversations she mentioned she hated to hear men say they loved her. I was understandably confused at her statement and asked why. She said it was because it always turned out to be a lie. One day I was watching her put on makeup and get ready for work. I must have been staring at her a little weird because she suddenly blurted out, “Don’t look at me that way!” I was a deer in the headlights. “What way?” I asked feeling really nervous. “You’re looking at me like you love me.” I couldn’t and wouldn’t say it. It had been purposely set up this way; at least it felt like it at the time. Soon after the entire fling fell apart. She ended up going out with another man behind my back and I began to build a wall of self-pity. The foundation of this eventual prison was built on a single desire; the one that almost killed me. Everything I did for years was tethered to avoiding the action and emotion of Love. Slowly, painfully, this pursuit drove all the passion, all the color, and all the variety out of my life. I became a generic person, a “human” who “worked” and “ate.” My value to the rest of humanity was soon bottom shelf. Living only for the sake of living will eventually cause one to run out of reasons to continue, and in time that’s exactly what happened to me. Survival was my singular quest and even that began to erode with a lifestyle of escalating self-abuse. My primary goal was quite honestly, oblivion. I shunned any responsibility other than those involving support of my my basic needs; earning enough money to buy alcohol and stay off the streets. For twelve long years I lost touch with my spirit until quite by accident I invited Love back into my life. It re-manifested by uttering a single, heartfelt word. When I finally reached out with a willingness to leave everything behind, including my possessions, my belief systems, and even my acquaintances, I found an abundance of outstretched arms willing to guide and support me. The trip has been stormy and frightening, but never have I lost my footing. When I couldn’t see ahead I was carefully led. Every action that pulled me further from certain doom was carried out with patience, compassion, and understanding. My surrender of the past and embracement of a mostly unknown future has remained dedicated and focused. As a result, twenty years later, I now have what many may see as an enviable life. I’m at peace, I have a beautiful, loving, responsible, and sober wife who’s also my best friend. There’s no need for anything yet I have access to resources for manifesting whatever I want. Best of all I’m back in touch with myself. You see, when I decided Love wasn’t worth pursuing, I unintentionally lost what positive feelings I had for myself. A connection to spirit vanished. The decision to eliminate this action, this emotion, led to the eventual elimination of ALL motivation and feeling. No matter where Love may lead me now, I choose to embrace it because it is the nourishment of a life well lived, and I encourage all to feast.